Figuring out the order of boiling points is all about understanding trends. The key thing to consider here is that boiling points reflect the strength of forces between molecules. The more they stick together, the more energy it will take to blast them into the atmosphere as gases. There are 3 important trends to consider. The relative strength of the four intermolecular forces is: Ionic > Hydrogen bonding > dipole dipole > Van der Waals dispersion forces. The influence of each of these attractive forces will depend on the functional groups present. Boiling points increase as the number of carbons is increased. Let’s have a closer look:. Trend #1: The relative strength of the four intermolecular forces . 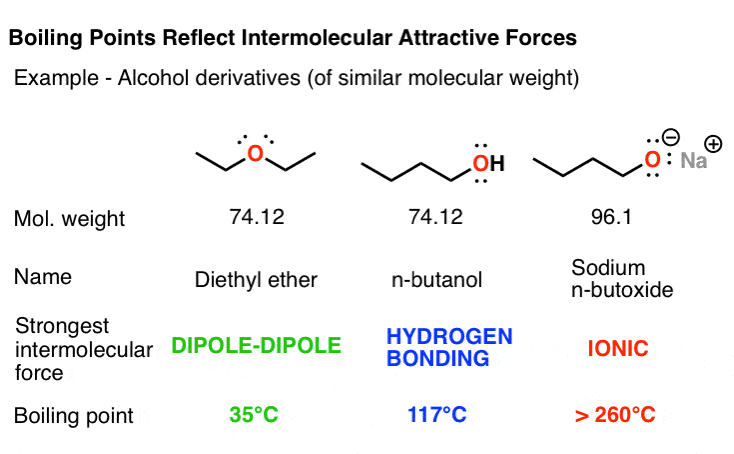 Compare the different butane alcohol derivatives shown below. Molecules of diethyl ether, C4H10 O, are held together by dipole-dipole interactions which arise due to the polarized C-O bonds. Compare its boiling point of (35 °C)with that of Its isomer butanol (117 °C). The greatly increased boiling point is due to the fact that butanol contains a hydroxyl group, which is capable of hydrogen bonding. Still, the attractive forces in butanol pale in comparison to those of the salt sodium butoxide, which melts at an extremely high temperature (well above 260 °C) and actually decomposes before it can turn into a liquid. Then think about butane, C4H10, which contains no polar functional groups. The only attractive forces between individual butane molecules are the relatively weak Van der Waals dispersion forces. The result is that butane boils at the temperature at which water freezes (0° C), far below even that of diethyl ether. Moral of the story: among molecules with roughly similar molecular weights, the boiling points will be determined by the functional groups present. You could tell a similar tale for the similar amine and carboxylic acid isomers shown below. For a previous discussion of the 4 intermolecular forces, see here. For the reference in Reusch’s textbook, see here. 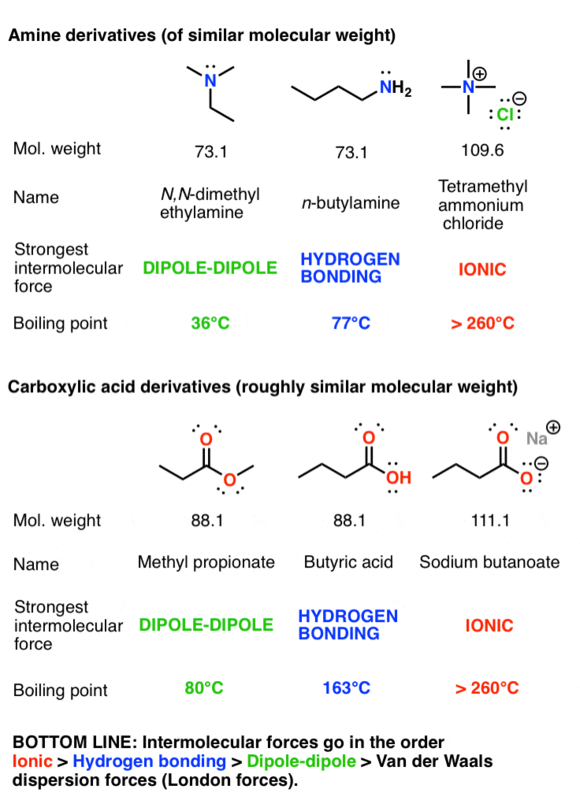 Trend #2 – For molecules with a given functional group, boiling point increases with molecular weight. Here’s the question: How, exactly do intermolecular forces increase as molecular weight increases? Well, the key force that is acting here are Van der Waals dispersion forces, which are proportional to surface area. So as you increase the length of the chain, you also increase the surface area, which means that you increase the ability of individual molecules to attract each other. On an intuitive level, you could compare these long molecules to strands of spaghetti – the longer the noodles, the more work it takes to pull them apart. As the chain length increases, there will be regions where they can line up next to each other extremely well. Individually, each interaction might not be worth very much, but when you add them all up over the length of a chain, Van der Waals dispersion forces can exert tremendous effects. 3. Symmetry (or lack thereof). This is another byproduct of the surface-area dependence of Van der Waals dispersion forces – the more rod-like the molecules are, the better able they will be to line up and bond. To take another intuitive pasta example, what sticks together more: spaghetti or macaroni? The more spherelike the molecule, the lower its surface area will be and the fewer intermolecular Van der Waals interactions will operate. Compare the boiling points of pentane (36°C) and 2,2-dimethyl propane (9 °C). It can also apply to hydrogen bonding molecules like alcohols – compare the boiling points of 1-pentanol to 2-pentanol and 3-pentanol, for instance. The hydroxyl group of 1-pentanol is more “exposed” than it is in 3-pentanol (which is flanked by two bulky alkyl groups), so it will be better able to hydrogen bond with its fellows. In summary, there are three main factors you need to think about when confronted with a question about boiling points. 1) what intermolecular forces will be present in the molecules? 2) how do the molecular weights compare? 3) how do the symmetries compare? One last quick question for the road (see comments for answer). P.S. New! Check out this free 3-page handout on solving common boiling point exam problems! Thank you! I am studying Chemistry at university, this has helped a lot!! Thanks, glad you found it useful. Shubham, I guess h20 has higher bp than nh3. Rest are correct. H2S has a much lower boiling point than water as well. H2S cannot form hydrogen bonds. Thank you! This helped me a lot too! 1.ionic bonding is not an intermolecular force; it is an intramolecular force? network covalent, ionic, metallic… -inorganic compounds! 2. there is something called optical isomerism. R and S enantiomers’ mp and racemate’s mp are different; important stuff if you’re mastering organic chem. why can’t it be both? I’m thinking mostly of salts of organic compounds like Me4N+ Cl- which have very high melting points as opposed to network solids like NaCl or other inorganic compounds which are not really “molecules” per se. thanks for mentioning the R/S as well, that’s an important point! I’m having a problem with the branching rule you pointed out in this article. Wouldn’t branching increase the boiling point as it leads to the molecule’s shape being more spherical and tightly packed. So with a tightly packed molecule, it takes more energy to take it apart thus, branching should increase b.p. More tightly packed would give it a higher melting point. 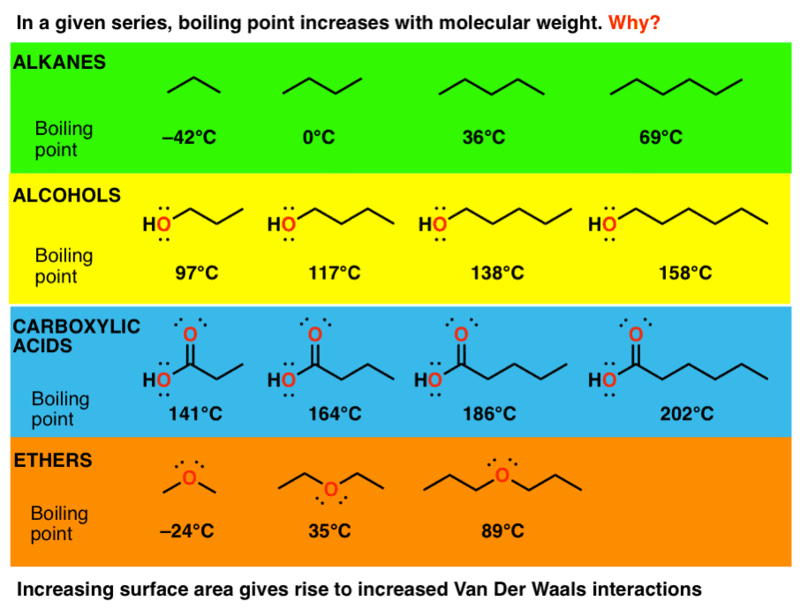 But the lessened surface area would result in a lower boiling point due to lessened Van der Waals interactions. how can u compare , mp and bp , on same molecule,?????? mp is given 4 solids , and bp 4 liquids …..
for instance —– we have a glass of water,, in which there r many H2O,, molecules,,, here we r not talking abt ,,,, h-o bond,, its abt the interaction b/w 2 H2O molecules ,,,,,,,wat we generally says , intermolecular forces ……..
How does branching affect melting point? I get the fact that branching decreases bp because of the decrease in surface area, hence less opportunities for Van de Waals interactions. However, how does it work for melting point? When it is branched it is harder to stack, right? Then, a lower melting point? I would think that branching leads to lower melting points, for exactly the reason you mentioned. Branching actually increases the Melting point of a molecule because it decreases the surface area causing it to become more tightly packed. However, it decreases the BP because less Van de Waal interactions are able to occur. Glad you found it useful sumaiya. Answer to question in post: the amine with the NH2 will have highest boiling point (most hydrogen bonds) followed by NH and then the molecule on the farthest right. If you had to focus on one thing, I’d look for hydrogen bonding groups such as OH and NH. This will increase the boiling point significantly. Thanks. This piece is very educative. Good question. It is likely due to the greater electronegativity of oxygen (3.4) versus nitrogen (3.0) leading to a larger dipole, which means that the molecules will have a greater force holding them together. Post more examples! Students would refer to them for practice. Good site! This is an amazing reference that simplifies properties affecting boiling point, which can be confusing when it comes to the many factors that can come into play!! It does a much better job than my professor, who’s really good, or the book were able to do in demystifying all of the above. Thank you to whoever made it!! I’m cramming for the OAT and this table helped a LOT! Thanks! this was quite insightful, but i have a problem i was given a question to compare pentane and diethyl ether. Based on the information i have seen it looks like pentane has a higher boiling point than di-ethyl ether, based on actual BP but your information tells me that it should be otherwise as diethyl ether has dipole-dipole interactions and pentane has van der waal forces. Could you clear up for me which should actual have the higher BP and give a reason for the answer? Excellent point! I don’t have a good answer as to why pentane’s BP (36 deg C) is higher than Et2O(34.5 deg C). Interestingly the boiling point of tetrahydrofuran (C4H8O) is 66 deg C, because the ring gives it a permanent dipole moment. pentane has higher bp due to more no. of C atoms. Higher molecular weight is one thing. C-H does not count as a “hydrogen bond’ because carbon is not electronegative enough. Only O-H, N-H and F-H bonds participate in hydrogen bonding. I don’t understand why octane has a higher BP than chloropentane. You’re comparing two different variables there; chain length (8 carbons vs. 5 carbons) and polarity (chlorine is electronegative). It’s hard to predict how boiling points are affected when you change more than one variable. If we have a molecule with hydrogen bond and one alkane. If alkane has greater molecular weight than hydrogen bond, which on has highest boiling point? Hi Lil, it’s difficult to compare two variables at once because it’s hard to gauge the relative importance of each variable from first principles alone [this is what experiments are for]. In the example mentioned, comparing heptanone and propanol is difficult because we’re comparing two variables at once: chain length and the polarity of the functional group. The key takeaway from this article is that if all variables except one are the same, you can predict boiling points based on these concepts. You’ll find that exams will generally test one variable too. do we only can compare the molecular size and molecular shape for the similar molecules or we can compare the size and shape for molecules with different functional groups ? for example can i compare the size and shape of pentanoic acid with heptane ? It’s tricky to compare two variables (chain length and functional group) at once. Generally you just want to know the impact of each variable individually. Thank you so much, i’ve been looking for something clear and easy to understand about trends in boiling points and this has answered so many of my questions! Keep up the fantastic work. Does vander walls force mean the same thing as dipole induced dipole force? It’s probably way too late..but no, it isn’t the same thing. Dipole-induced dipole is describing the attractive forces between a polar molecule (dipole) and an induced dipole (dispersion, london, van der waals). Instead of looking at one isolated force (such as disperson), dipole-induced dipole is describing two that are attracted to eachother…temporarily in the case of induced dipole. which will have the higher boiling point, C6H14 or C2H5OH and why ? In this case we’d be comparing two different variables (chain length *and* polarity of functional groups) and it is difficult to predict which factor is more important. I would look for examples of compounds you are curious about and compare their known melting points/boiling points. Why does branching in alkanes lows the boiling point …? Branching reduced the ability of a molecule to ‘stack,’ making its state less solid and its boiling point lower. Great. Glad you find it helpful for the DAT Nikki! This does not explain boiling point. All three have the same number of carbons and the same number of branch points. Help! I cannot not leave a comment. Thank you so much :)) I’m currently taking up Organic Chemistry and this has helped a lot! Please tell me why is the boiling point of Butan-1-ol greater than that of butan-2-ol? What a great summary, and really reafable. I’ve been struggling to get to grips with Chemistry as part of a course I’m doing. This is the best site I’ve found, thank you for putting things in terms I truly understand! Thanks James! extremely helpful. Now iam clear about the concepts. Please do keep posting such concepts. I am also taking Orgo I and came across a problem I couldn’t figure out. Given 3 alcohols : tert-butyl, sec-butyl, and n-butyl with their respective boiling point measurements at : 82C, 100C, and 117C. 4 carbons, same molecular weight for all them, same intermolecular forces? What creates the differences in their boiling point values? Is it the location of the hydroxyl groups? The key factor will be surface area. The linear chains have a higher surface area than the branched alkyl groups (which are more “spherical”) and since van der waals forces are proportional to boiling point, the linear alkyl groups should have higher boiling point. I am having a little problem in understanding the melting point trends……why the following melting point increase is uneven……….formic acid(m.p 8.4) then ethanoic acid(m.p 16)…but then propanoic acid (m.p -21)…..then pentanoic acid (m.p -35)…………………It seems appropriate to understand boiling point trends which increase with molecular size as van der waals forces incrase but how does melting point trend works? Glad to hear it Jillian! Thank you for your comment! I understand branching increases M.P but I don’t totally understand d reason..
Why does NO2 have a greater boiling point than SO2? Both are polar, dipole-dipole interactions, but SO2 has a greater dipole moment, greater molar mass, and greater surface area. I know NO2 is a radical, does that affect boiling point? Hey there, just wanted to stop by to say how much I appreciate this website. You have an exceptional ability to present material in a concise, understandable fashion. I wish you were the author of my organic chemistry book or my professor, because this year I have been teaching myself organic chemistry using your website and my textbook (lecturer is awful) and received an A+ in ochem 1. Thank you! Why does trans but-2-ene has higher melting point but lower boiling point than cis but-2-ene? Is this because of dipole moment? Water will generally lead to depression of the melting point, not raising it. Thanks…you made it extremely understandable…. Nice, really appreciate your broadness without sticking to a job. Society might wish in a bigger way than what you had opted earlier…One thing Dear professor James , when we are discussing about boiling point , I have to say that, does the factors like sterically hinderedness of a molecule come to scenario or we shall ignore about the effects. Let you know that I am working as an assistant professor in the University, India. Welcome you and your page with open arms. Thanks, this was super helpful!!! How chlorine will affect the boiling point of a alkyl chain for exemple 1-chloro-octane compare to octane? Here, I summarized some boiling point of halobutane alkyl chain by increasing boiling point order. With that in hands, it’s eazier to see the trend of adding different halogen atom even mixing them on a butane alkyl chain. Great resource, even for Organic Instructors! Thank you for making the content concise and easy to understand! Thanks a lot….. It helped a lot. Also the sheet is pretty amazing. Can you please explain why ethoxy ethane have a lower boiling point than n-pentane? What about the higher boiling point of methoxy ethane when compared to n-butane? That is a pretty wild fact, isn’t it. You would not expect that diethyl ether would have a lower boiling point than pentane. A little confused on this, isn’t boiling point a colligative property? So the boiling point elevation depends only on the number of particles present in a solution, not the nature of those particles? Or does that colligative property factor only apply for ionic bonds – which is why they’re so much higher boiling points compared to the organic molecules. We’re not dealing with solutes & solutions here, just the boiling points of the liquids by themselves. Each pure compound has a distinct boiling point which depends on the intermolecular attractive forces. this is very helpful, boiling point started to make sense already by that list at the beginning. before finding this i was looking through my class notes and textbook trying to find out what made a difference in a molecules boiling point and i couldnt find a good answer.using this page i was able to answer a question on my assignment. i’m going to study the printable sheet so that it’s easier next time. Cool, I’m glad you found the sheet helpful Megan. Learning the trends is key! Rank the following from lowest to highest anticipated boiling points: C2H2, CH4, Ne, H3COCH3. Start by asking yourself what intermolecular forces are possible in each of these molecules.